In "time trialling in the 1980's a racer's guide" I may have taken an amusing and perhaps smart-arse approach in exposing the benefits of steel bikes, yet inadvertently as readers of Velo Aficionadopointed out, steel is a highly adaptable material, tailor made for the hands of talented artisans. Carbon materials lend themselves to an array of possibilities via hi-tech mass production facilities and as graphically described by Brian, can kill you when ripped into shards. Steel proving the ever popular choice of material by so many different strands of cycle-sport and related activities, fixies, randonneur to name a couple of standouts, from there the list extends to all facets of riding. With elite racing carbon has found it's niche, and is ever popular with bicycle buying followers of elite bike sports. The hi-tech carbon game spiraling ever higher with bikes like the Vis Vires, and now Google Glass, as Neil Browne on his Brown Eye cycling blog describes as gear for "glassholes". Travel outside of the world of race bikes and you'll find people with their feet firmly in touch with terra firma, these people working with and riding bicycles made from steel, wood, bamboo, titanium, aluminium alloy and more. Real world sensibility renders any notion that steel is a thing of the past as a moot point, in racing circles maybe, but elsewhere emphatically not. Steel is endlessly adaptable. Everywhere frame builders are opening up workshops and working with steel. To name just one Helio Ascari is bringing classic vintage steel styling back to the streets. Back to time trialling and the 1980's racer's guide, here we have an Italian Pieroni as an example for consideration. This machine exemplifies the robust and adaptable properties of steel, in a bike which displays as a blinding panorama of the mindset of the early eighties frame builder. Take a look at the seat tube where it meets the bottom bracket, an over-statement of "can be used to help coax lightweight tubing into conforming to many mangled shapes". Steel made to conform to the mind of the maker is stretched beyond it's limit. The Columbus tube looking more like that bent and crumpled talking wizard's hat from the very first Harry Potter film. This Air 2001 Pieroni with it's twisted metal reminds me also of Matt Leasegang's Kenevan's Mal Macpherson built Teams Time Trial Bike. Here the Pieroni with it's curved seat stays, the seat tube hugging the curve of the back wheel, and other bent tube arrangements, could well have been conceived by an artist as an attempt at making a caricature of what a bicycle is. The sinuous curves of some nineteen eighties time trial bikes is accentuated in this small 49 cm version by the Italian builder - Cicli Pieroni via Casette D'ete - located on the East coast in the province of Fermo. Reputedly Pieroni only produced a handful of hand-built race bikes. The current owner reckons it's a spin off from a Somec frame builder, their operations located much further north in Ravenna. Stating that "This bicycle was made by Pieroni, the frame builder of Somec. Under his own name he made serveral frames, this is the most special." The founder of Somec being Oliviero Gallegati. Somec do have as they call their, beloved, Pierino Scarponi. Whether Pierino adjusted his name to Pieroni and attached this to Cicli Pieroni of Casette D'ete, or someone else from Somec, is not clear. The company name Somec is derived from an abbreviation of "Societa' Mecchanica". The Somec brand has it's roots in the Romagna region of Italy where Somec reckon that the passion, love and devotion to cycling "are at their apex." Only two Italian firms have ever had the blessing of Francesco Barraca's family of Lugo, to use the stallion emblem, which Francesco the aviator had emblazoned across his war plane. Ferrari and Somec. Take a look at the Cicli Peroni bike and the eagle emblazoned into it's head tube together with the words, Cicli Pieroni casette d'ete, bears a striking resemblance to the eagle crest bestowed upon Bianchi by the Royal House of Savoy. The decal across the top tube denotes the use of Columbus Air 2001 tubing. Take a look at Somec catalogues from that period, and if this was a genuine Somec builder creating under the name of Pieroni, then it's possible that the Air 2001 has been combined with Columbus SLX and SPX, complete with Campagnolo dropouts. 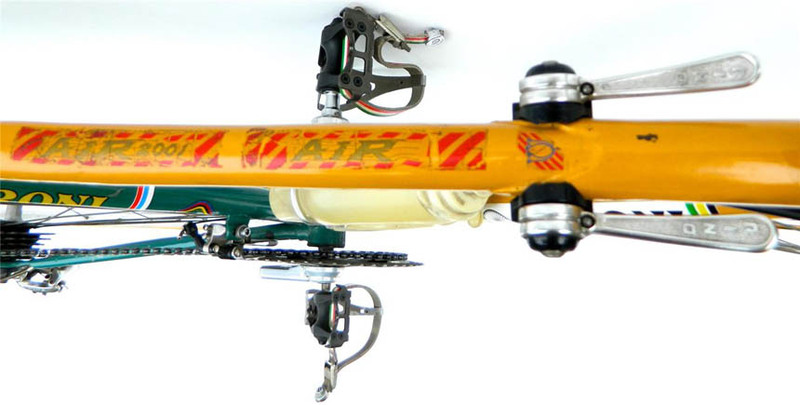 Plus a unique top-tube gear shift arrangement with a thin tube, running the cables from top tube to down tube. A Rino Excel Cambio Aero group-set is combined with a Selle San Marco saddle, 3TTT stem, Gipiemme seat post and Universal brake calipers. A chrome fork crown, is matched with a very Aussie looking green and gold paint scheme. Rip that six speed free-wheel out and toss it round for weight comparision, you'll be glad of your lightweight umpteen geared modern version. Throw in the impossible PMP cranks a rarity themselves and the Cicli Pieroni becomes a real collectors piece. Note the drilled chain rings, it's not your typical "hard-man" TT bike, there's an inner ring - for extra weight. A special thanks goes to Michel from Italian Bicycles for allowing use of his images, he's selling this one right now if you're up for adding a piece of Italian history to your collection. Joe Cosgrove asks the question, Can a bicycle die? Geoff Scott talks about his life as a custom frame builder of Gefsco and Clamont bikes. Llewellyn Custom Bicycles Shimano Dura Ace Di2, with a nod to tradition. Legend Bicycles handmade using all popular frame materials by Marco Bertoletti in Presezzo Italy.